A couple months back I was struggling with whether I should continue writing. God had led me to start this blog and God had led me to sign up for the She Speaks conference. Deep inside of me I knew those two truths, however, I was wrestling with insecurity. One day when it seemed my insecurities might end up winning, I read this in my Beth Moore devotional, "Believing God." This one statement rocked my world. It consumed my thoughts. Who am I going to believe? Am I going to let my insecurities and fears win the wrestling match? If God is for me, who can be against me? God knew I needed encouragement and He would use this statement to frame the outline of my talk I would give to my peer evaluation group at She Speaks. God gave me this talk to give so every time I practiced it, it would be a reminded to believe Him. A couple months back we went to Blizzard Beach, which is a Disney Water Park. At the park, there is a pool with scattered white glacier-like floats in the water. There are ropes overhead for the kids to hold onto as they walk across the water on the scattered floats. We have a little 4 year old girl named Sarah who wanted to try to walk across the water. The only problem was that she could barely reach the ropes to hold onto as she went across. Her heart pounded as she looked at the unsteady floats and icy water underneath. I encouraging her to try and reassured her I would be right there to help her get across the water. She was put in a position where she would have to choose who she would believe, her fear of falling or her faith in me to help her get across the water. Would she have faith to go across or would she let her fears keep her by the side of the pool? I relate to Sarah, we all can relate to Sarah. Sarah’s comfort zone was by the side of the pool. I also like sitting by the side of the pool, only my side of the pool was sitting in the crowd. The podium is my water. God was asking me to walk across the water, only I didn't see any floats and ropes to help me get across. But of course, I have something much better….the Holy Spirit. God had put me in a position in which I had to wrestle with my identity. I had to make a choice on who I was going to believe. Would I believe I am who God says I am? Would I believe His Word and in His faithfulness? After all, it isn’t really about me, it is about Him and what He wants to do. There are many times in life when God will put you in a position where you are forced to wrestle with your identity. At those times, you must choose who you will believe. Are you going to believe God or yourself? Are you going to believe your circumstances or any lies Satan has tried to feed your thoughts regarding your circumstances or yourself? Are you sitting by the side of the pool today? What is your “water” that you need to walk across? Are you going to believe the enemy, you or the Lord your God? Let’s go to Matthew 14:25-31 to see a story in the bible of another person who walked across the water and was forced to choose who he would believe, him, his circumstances, or his God. It is a familiar story. In whatever God asks you to do, He is always there to guide you, to encourage you, and to lift you up. He has already given you everything you need to accomplish His purpose and His will. His ability is in you, you just have to operate in it. He puts seeds of greatness in you! Peter got out of the boat, which is a great first step, but he could have made it all the way to Jesus. If he would have kept his eyes on Jesus, he would have made it! Jesus is the Word made flesh, so we must keep your eyes on the Word of God if we are going to make it across the water. DO NOT live life by the side of the pool! Jump in and start walking across the water by faith. Just like I wanted my daughter to make it across the water that day, God wants His sons and daughters to make it across the water. God wants YOU to make it across the water. Perhaps you are thinking, "But, you don't know what I've been through, you don't know how hard it is to jump in the pool." Yes I do, yes I do. I am no stranger to struggle. Lord knows I have wrested with my identity in Him. I have struggled with fear of rejection, fear of failure, and bondages of shame, and guilt due to past sin. I know how difficult it can be to jump in the water, but when we know how much the Lord loves us, it is so much easier to believe Him and that He has a good plan for us. We can be secure in His love for us, and as a result, confident in our calling, and peaceful in our circumstances as we trust Him and His Word. Just like Peter, we must keep our eyes on Jesus, the Word made flesh. My little daughter, Sarah, did not stay by the side of the pool that day, she made it across the water. And I am here today talking to you, so I also made it across the water, Praise the Lord! DO NOT spend another minute by the side of the pool, jump in by faith and keep your eyes on the Word. He is faithful. God wants you to make it across the water. So, there it is. That is what the Lord laid on my heart. He is doing a work in me, a work which I am grateful for. Just like when we go to the hair salon to get a new do and we are excited to see the final outcome, it is always exciting when God starts working on removing something in my life that needs cut off. In this season, my new do is freedom from self-doubt and I am thankful for the makeover! What does God want to do in your life? What causes your insecurities? Surrender it to Him and let Him give you a makeover, the outcome will be freedom! Outside the window that spanned the hotel room wall, the sun slowly rose above the trees as a quiet wake up call. Sunlight streaming into the room is my favorite way to wake up in the morning. The night before had been incredible. I was at the She Speaks Conference, an event I had been preparing to attend for months. My heart was full of anticipation. That afternoon I would have to give my first ever teaching talk to a peer evaluation group. There were many times leading up to that weekend that I questioned my ability, doubted whether speaking was part of God's plan for me, wondering what in the world I was doing. Now, the day had come for which I had been preparing. Was I ready? Would I forget what I was suppose to say? Can't I please just read from my paper?! No, I knew I couldn't do that. Oh Lord, I pray I will be able to do this! I looked in my devotional and in God's Word for a word of encouragement, something from the Lord to assure and affirm me. God directed me to Deuternomy 1:19-40. Only it was not necessarily an encouraging word, but a word of gentle correction from a loving Father. Not exactly what I expected, however, it was exactly what I needed. He took me to the story of where the Israelites had gone to the promise land and decided that the giants were too big and that they could not enter the promise land God had promised them. God had told them He would give them the land. The Israelites, however, did not believe God. They believed their fears more than God. Then I (Moses) said to you, "Do not be terrified, or afraid of them. The Lord Your God, who goes before you, He will fight for you, according to all He did for you in Egypt before your eyes, and in the wilderness where you saw how the Lord your God carried you, as a man carries his son, in all the way that you went until you came to this place. "Do you think I would take you all the way to this conference just to have your enemies defeat you? Do you think I would bring you all the way here and then leave you?" I saw how wrong I had been in my self-doubt. I went before the Lord in tears asking for forgiveness for my unbelief. He says in His Word that He will never leave us nor forsake us, that He will equip us for every good work. Did I believe Him? "I thought I doubted myself. However, doubting myself was also doubting the One who created me." In doubting myself, I was doubting the One who said He has given me everything that pertains to life and godliness (2 Peter 1:3). Doubting the One who said He has equipped me for every good work (Heb 13:21). God revealed to me in that moment an area in which I still need freedom. We are all a work in progress and I am thankful the Lord loves us too much to let us remain stationary. He is a forward moving God, always moving us forward in Him. On Friday, I will share the teaching talk the Lord gave me to share with my peer evaluation group. The Lord gave me this talk to encourage me, because He knew I needed it to help overcome my self-doubt. The words the Lord gave to me are still encouraging me. The Lord has started a process of freedom in me for which I am thankful. He has freed me from many areas in my life. As He unveils this tender area, I open my heart and allow the Lord to do whatever He needs to do for the chains to fall. Freedom is the goal, and I am running forward hand in hand with my Creator towards it. Father, forgive my unbelief. Transform me by the power of Your Word. My desire is for You. My desire is for freedom. Father, remove areas in my life that hinder me from being all You created me to be. Make me into the person You see me as so I can fulfill the plan You have for me. Forgive me for doubting. I pray for the confidence only you can give. Thank you for leading me on this journey, the journey of freedom in You. I pray you would use me to reach others for You and help them as they pursue freedom. In Jesus Holy name, Amen. Oh Holy Father, words cannot express the gratitude felt for all You did this past weekend. Again, I stand amazed by Your glory and greatness. Thank You for meeting me and holding my hand as we walked across the water together. You are amazing, oh God, my strength and redeemer forever. Thank You for pouring out Your love for me in countless tangible ways. Our God is so good. Let us praise Him today. He is faithful. He is good. Great is His love for us. For His mercy endures forever"
The sacrifice of praise sets the captives free. "Oh you of little faith, why did you doubt." I thought I doubted myself. However, doubting myself was also doubting the One who created me. In case you haven't noticed, I haven't been posting as much. It has been a little busier for me than usual over the past couple of weeks, so I've backed off of blogging to keep my sanity. : ) I love blogging, but I also love being sane. I am getting ready to attend a conference this weekend that I have looked forward to for months. It has taken a bit of preparation time and now it is finally here. I want to ask you all to pray for me this weekend. Please pray for peace, His annointing, the presence of the Holy Spirit, that God would give me utterance, that His will would be done. I am going expecting the Lord to show up in a mighty way. Thank you in advance for your prayers. Lately, I have camping on John 15. I love it! God's Word is just full of treasures! If you think about a grape vine....or any fruit or vegetable plant, the bad branches, dead vines, and weeds have to be cut away in order for the good fruit to flourish. Fruit is just a symbol here for our good works and the evidence of the love of Jesus in our lives. The greek word for "prunes" is kathairo and mean to cleanse of fithly impurities. When we are not bearing fruit, the Lord must deal with us, prune us. When we are bearing fruit, the Lord will also prune us. I've heard Joyce Meyer say, "We are pruned if we do and pruned if we don't." I'd much rather be pruned in the bearing fruit part. Ok, get ready...this is going to knock your socks off! It might be a little hard to chew for some of you. "You are already clean". I didn't say it, Jesus did. The greek word for "clean" is katharos and it means: Like a vine cleansed by pruning and so fitting to bear fruit; free from corrupt desire, sin and guilt; blameless, innocent. Are you getting this! You are already clean, you are already free from sin, you are already blameless and innocent! I told you it was good. Jesus has made you clean. If we are going to bear good fruits, we must stay connected to the Vine. We cannot do anything without Jesus. I remember the first time I read the verse above. It blew me away. Read it again. "If you abide in Me, and my Words abide in you, you will ask what you desire, and it shall be done for you." 2. When we are abiding in His Word, we know how to pray His will. Jesus wants us to bear good fruit. God wants us to bear good fruit so others will see that you are His disciples. It glorifies Him when we bear good fruit! Are you bearing good fruit today? How is your abiding? Are you camping out with the Lord? Thanks for camping out with me today in His Word. I pray for all of you to abide in Him and bear much fruit for His glory! Love you! You may have heard that song before in church or on the radio or maybe not. Either way, it is a catchy little ditty that is actually quite powerful. "Washed my sins away" is a phrase we hear in church or Christian circles. Have you ever thought about what it really means? Think about when your hands are dirty, and you go to the sink to wash them. You place them under the water and all the dirt comes off and goes down the drain. Does that dirt ever get back on your hands or is it gone forever? It is gone FOREVER! It feels so good to get the dirt off! That is what "washed my sins away" means. Jesus washed your sins away and they are gone FOREVER when you ask Him into your life, and ask Him to forgive your sins. It is such a great feeling to get rid of the dirt and be clean. I love how the Lord uses water to represent what He has done in our lives. We all can understand how water makes us clean. Water baptism is a public expression of what Jesus has done for us. When we are dunked in the water, that represents our old sinful self dying (like Christ dying on the cross), and then we come out of the water, that represents us being washed, made new by the blood of Jesus (raised to new life). Baptism is not the same as salvation, it is a public expression of one's salvation. It represents being born again. It was a "oh happy day" for our family this past Sunday! 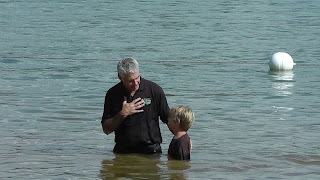 Our eight year old son, Joseph, was baptized in the lake at a nearby park called "The Cove." You were dead because of you sins, and because your sinful nature was not yet cut away. Then God made you alive with Christ, He forgave all your sins. Canceled the record, took it away and nailed it to the cross!! That is what Jesus did! All your past sins were nailed to the cross with Jesus! Again, oh happy day! So thankful for Jesus! Thank you, Lord, for washing our sins away....the old is gone, and behold all things are made clean and new! We are so proud of our Joe. Thank you for letting me share this moment with you and rejoicing with us in this "Oh happy day!" Recently, my husband and I took a weekend getaway trip to the Smokey Mountains. While we were there we dined at The Pottery House. I know it is a funny name for a restaurant, but I promise you it was very yummy! If you ever go up to Pigeon Forge, I recommend it. Next to The Pottery House restaurant is a pottery store. (I know, surprising isn't it?) In the store there were all kinds of pottery, practically anything you can think of made out of pottery. I enjoyed looking at all of the unique and beautiful creations that were made by hand. In the corner of the store was the man who had made many of the creations in the store. 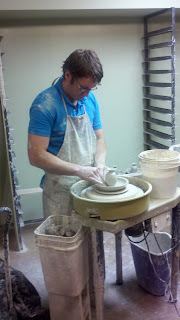 He was hard at work sculpting and shaping a piece of pottery on the potter's wheel. He was focused as he worked, perfectly forming his creation. As he worked, he removed the part of the clay that was not needed for the vessel he was making. He cut away the parts of the clay that would detract from the vessel's beauty or that would hinder its use. He molded every piece of clay into a vessel designed for a specific purpose. We are the clay and the Lord God is our Potter. He is forming us, molding us for a specific purpose. He is cutting away the parts in our lives that would detract from our beauty or hinder our use for His glory. The Lord is molding us into a work of art....beautiful and unblemished, perfectly formed for His glory. Oh, how we need Jesus! Without Jesus, we are just a lump of clay. I don't know about you, but I don't want to be just a lump of clay! Oh Lord, mold me into Your image. Form me by the works of Your Mighty Hands. Oh Lord, how I desire to be like You. Father, make me into a vessel You can use for Your glory. Teach me Lord to live all of my life through Your eyes. Set me apart.......lead me, fill me. I give my life to the Potter's Hands. Last night my husband and I watched a wonderful movie titled, "Secretariat". The story was about the horse they say was the greatest race horse of all time. It was an excellent movie. "It doesn't matter whether they think we won, what matters is that if we think we won. So many times in life we are trying to win a race we were not even meant to run. We get concerned about how others view us and if we look like we are successful to them. Success in God's eyes is not measured the same as the world views it. Success is not measured merely by external meters, success is measured by how well you run your race. In the movie, Secretariat almost always started out in last place out of the gate, however, he finished his race a winner. It isn't how you start the race that counts, it is how you finish. Turn away from sin and look until Jesus, the author and finisher of our faith. We can only run our race effectively and victoriously if we stay focused on Jesus. Do not be moved by what you see around you. Do not be moved by your circumstances, God is bigger than your circumstances. God will see to it that you finish your race with joy and win it when you look to Him. Your Father has said you have already won, you just have to Run Your Race! I am a hotel snob. I enjoy staying in nice places and beautiful resorts, and I am a little snobbish about it. I hope you do not think any less of me knowing this about me. Last week, Chris and I made a last minute decision to take a weekend getaway from everything. My parents were in town and they agreed to watch the kids so we could getaway. So we began our online search of hotels, cabin rentals, and bed and breakfasts. Our goal was to find the perfect weekend getaway for us. I realized my sin that night and I did ask the Lord (and my husband) for forgiveness. God has a way of getting my attention when I am acting in a way unbecoming to Him. He'll say to me, "Sue, what are you doing?" I have to admit that without Jesus, there is really nothing good in me. I have nothing to offer on my own, anything good in me is because Jesus Christ is in me. I have seen who I am without Jesus and it is not pretty. I am so thankful that I am a new creation in Christ. There are times when I am reminded of who I was before Jesus, and I do not like that person! I am so thankful for MERCY. God is so merciful to forgive us when we sin and then come to Him in sorrowful repentance. I love that "lightness or lifting up". Jesus took the burden of our sins. Once we ask for forgiveness, we are lighter, we no longer carry the sin. We have been pardoned! The reason for the Lord's mercy is to show His goodness. When we praise the Lord because of His mercy and all He has done, He is glorified and honored and His goodness is revealed to others. I am so thankful for His mercy. His mercy is new every morning and it endures forever. We may not deserve mercy, but thankfully the Lord does not give us what we deserve. We deserved death on the cross, but Jesus took what we deserved. Although I did not deserve a nice getaway after my attitude Thursday night, the Lord showed me mercy. We ended up having a wonderful time in a nice quiet cabin. It was a perfect time full of peace, relaxation, and refreshing. I was even more aware of His goodness and mercy as we enjoyed His blessings this weekend. When we realize how undeserving of His grace we really are, we are very thankful to experience it. I was very thankful for the nice place we had this weekend, very thankful for the Lord's mercy and grace. The Lord is good and His mercy endures forever! Dear Heavenly Father, thank you for your mercy, thank you for your loving kindness. Although we mess up and sin, you are always faithful to forgive us and extend your mercy and grace to us. Thank you for Jesus, thank you loving us so much that you sent Jesus to take the penalty for our sins. We deserved death, but you gave us life. Thank you for your mercy and grace. We love you. In Jesus Name, Amen. It is July 4th weekend! Time for cookouts, watermelon, fireworks and family! (Hopefully, it isn't being with family that causes the fireworks!) Seriously though, it is a time beloved by Americans as we remember those who gave their lives for our freedom and we reflect on the greatest of our country. As I look at the fireworks, I am always reminded of "The rockets red glare, the bombs bursting in air" in remembrance of that night when our Flag was still there and America became a free country. It brings me to tears every time, and I am so thankful to an American. America is a special country. What is it that makes our country special? Immigrants have come here from around the world in pursuit of the "American Dream." They came for one reason only.....FREEDOM. Freedom is what makes our country special. The hope of achieving whatever dream God has placed inside of us. One can only pursue a dream when one has freedom to do so. Our Declaration of Independence states that "we our endowed by our Creator with certain inalienable rights, that among those are Life, Liberty, and the Pursuit of Happiness." From our founding, America has recognized the role our God has in our lives. It is the Lord our God who gives us freedom. If you look around the world at other countries who do not recognize God, in those countries, freedom is dramatically absent or greatly hindered. The more God is removed from a country, the less and less "free" that country becomes. It grieves my spirit and it grieves the Lord. It is His desire for all to know Him and believe Him, and it is His desire for all His Children to be free. A couple weeks back, NBC made a grave error when they decided to omit the words, "One Nation Under God." from the Pledge of Allegiance in a commercial during the U.S. Open. They tried to cover it saying it was an honest mistake. However, people have been trying to remove God from our country in increments for 50 years and I am not so sure it was just an oversight. Consequently, the American people took a stand and I was so proud of the American people. The American People stood up that day and said, "NO!" Americans were outraged and we let NBC know it! NBC apologized for their misjudgement. America has always recognized God's role in a nation's success. America has always been "One Nation Under God." I pray that we always will be "One Nation Under God, for the day that America ceases to recognize God in our nation, is the day our nation will cease to be great. We, as America, have made many errors and we have grieved the Spirit of the Lord with many of our decisions. When we elect godless people to represent us, they make decisions that take us further and further away from the Lord as a country. We need to be on our knees in prayer for our country. It is our duty as Christians and Americans. Thankfully, America is still "One Nation Under God" and I believe it pleased the Lord to see His people stand up for Him a couple weeks ago. However, our country is sick and infested with sin and we see the consequences of godlessness. Our nation needs to seek the Lord's face, turn from its sin, and it needs healing. This weekend as we celebrate our freedom, our liberties, let's remember the One who gave us that freedom and pray for our nation. If you can, take a moment now to seek the Lord and pray for our nation.....He is faithful to heal our land. Have a great July 4th weekend!